President Moon Jae-in calls for ‘inclusive growth’ among APEC countries. President Moon Jae-in returned to South Korea on Sunday after wrapping up his five-day trip to Singapore and Papua New Guinea amid ongoing diplomatic efforts to resolve stalled denuclearization talks between the US and North Korea. In his meetings with the leaders of China and Russia, as well as with US Vice President Mike Pence, Moon reiterated his role as an honest broker in rallying international efforts to convince North Korea to abandon its nuclear program and open up the country. The move appears to be a shift from Moon’s previous call for the easing of international sanctions against North Korea, made during his trip to Europe last month. The US and its European allies have maintained that sanctions must remain in place until the North abandons its nuclear weapons in a complete, verifiable manner. “We expect Russia to play a more active role in making North Korea become more proactive on the denuclearization measures,” Moon was quoted as saying by his spokesperson Kim Eui-kyeom after his meeting with Russian President Vladimir Putin on Nov. 14. While Kim acknowledged that the two leaders had discussed the issue of sanctions relief after Putin called on the US to reward North Korea for its good-faith measures, Moon’s remark appears to suggest that he has become more cautious on the matter. During his trip to Europe in October, Moon said relaxing UN sanctions should be considered when North Korea reaches an “irreversible phase” of denuclearization. But the idea was rebuffed by European states, particularly those with permanent seats on the UN Security Council. Moon’s restraint was evident during his meeting with Pence, which took place amid concern in Washington that North Korea may have violated its denuclearization pledge. Voices within the US media and at US security think tanks have criticized North Korea for operating “undeclared” missile bases. While Pence reiterated the US stance that the sanctions pressure campaign will remain in place, he indicated that the US will not require North Korea to provide a complete list of its nuclear weapons and missile sites before the second summit, scheduled for early next year. Pyongyang and Washington had been in deadlock over who should make the first move. While the US called for North Korea to provide a full accounting of its nuclear arsenal, Pyongyang insisted that Washington should first reward its good-faith measures by lifting economic sanctions. Cheong Wa Dae said Moon’s meeting with Pence is a sign that progress is being made between Pyongyang and Washington and the Trump administration expects Moon to assume a more proactive role in mediating the deadlocked negotiations. “Considering the context (of the Moon-Pence dialogue), we understand that there is progress on dialogue between North Korea and the US. We believe that is the background in which Pence made the request to Moon.” spokesperson Kim said. At a meeting with regional leaders on Sunday, Moon called for inclusive growth among the countries of the Asia-Pacific region, pledging that South Korea will play a crucial role in addressing the worsening global disparity on socioeconomic issues. In his speech at the Asia Pacific Economic Forum summit in Papua New Guinea, Moon proposed to establish a fund for implementing the APEC Roadmap on Internet and Digital Economy, an initiative agreed to during last year’s APEC summit in Vietnam in an effort to bridge the digital divide in the region. 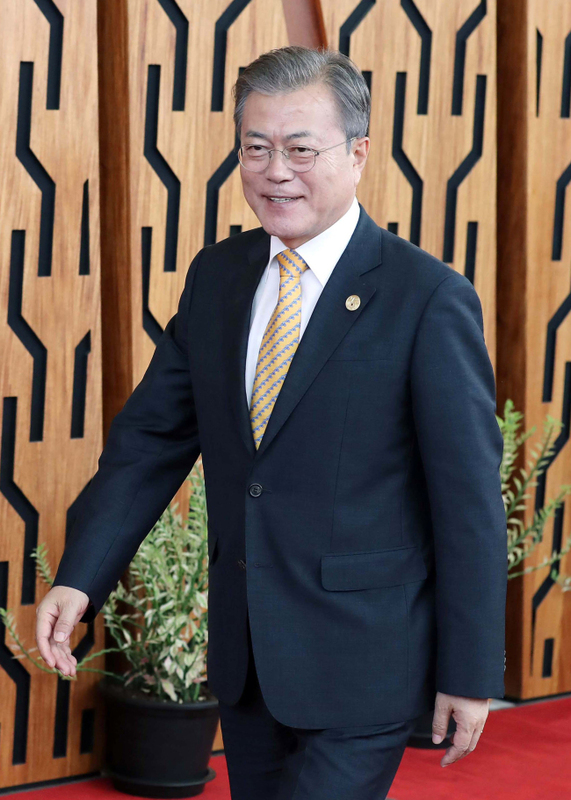 Moon made the remarks after he laid out his vision of establishing an “inclusive state” during his meeting with Cabinet members and top aides. The vision aims to tackle the country’s worsening income disparity and grim growth outlook. His remarks appeared to reflect South Korea’s attempt to support APEC member states’ efforts to bridge the digital divide and promote sustainable growth. They have held a series of talks with the goals of developing digital infrastructure and promoting interoperability among member states. Moon has been seeking to reduce the disparities among socioeconomic groups under the policy of “income-driven growth.” The president and his aides have blamed growing income disparity for South Korea’s low economic growth. The initiative has sparked mixed reactions across the political spectrum, as the Moon administration has implemented several controversial policies, such as raising the minimum wage, reducing working hours and converting temporary staff positions to permanent positions.